I’ve always felt that building websites is less about the one’s and zero’s of the digital end result, and more about the people I’m partnering with. As someone inspired by people with dynamic visions and big dreams, I wanted to work with people who had a purpose, a message. A raison d’être. I didn’t want to just name my company something generic or meaningless like “ABC Web Design” or “Flibberidoo Design” – I wanted the name to evoke a certain feeling, much like the purpose-fueled missions of my clients. Relaxed, calm, and easy-going – which describes the ideal state of my brain on a good day, and the way I prefer to work. 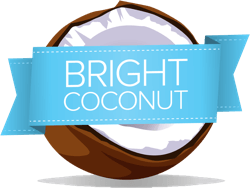 Add to this my love of the tropics and a mild (not really) obsession with coconut — in addition to being an amazingly heathy food that tastes delicious, it also invokes wonderful memories of a childhood trip to Hawai’i — the tropical vibe jumped into my brain and Bright Coconut was born. 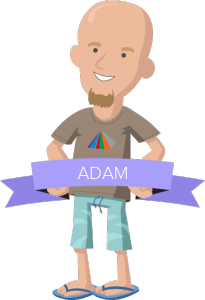 I’m Adam Kayce, and I’m the man inside Bright Coconut. Born in San Diego, I wandered around the country for a good fifteen years trying to find my spot. I now live in Austin, Texas, with my two daughters (who are growing up way too fast), and have no plans to move anytime soon. In the name of sanity, I’m minimizing my time on Facebook (and I’ve totally dropped the rest of social media), but I do love to connect with fellow coconuts, so feel free to say hello. I’m a fan of story, coffee, and minimalism, both in design and in my approach to life. I like to cook, eat (mostly) paleo, read fiction (fantasy novels are my “mental escape pod”), and I gave up wondering where my hair went a long time ago.